Are you searching for photos and ideas for wedding flowers in church? 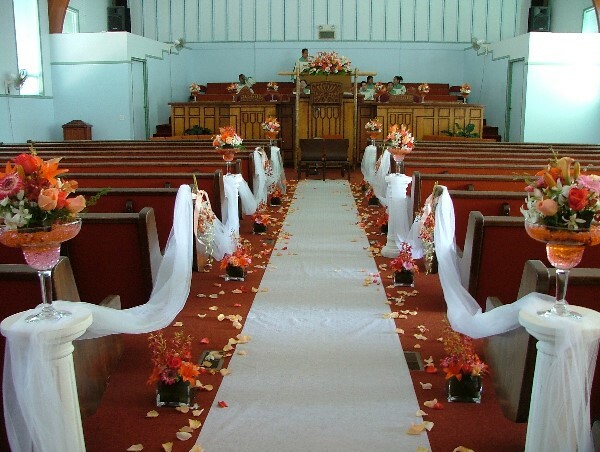 If you are getting married in a church you are probably wondering what is the best way to decorate it for the ceremony. Where should you put flowers? How much is not enough and how much is too much? 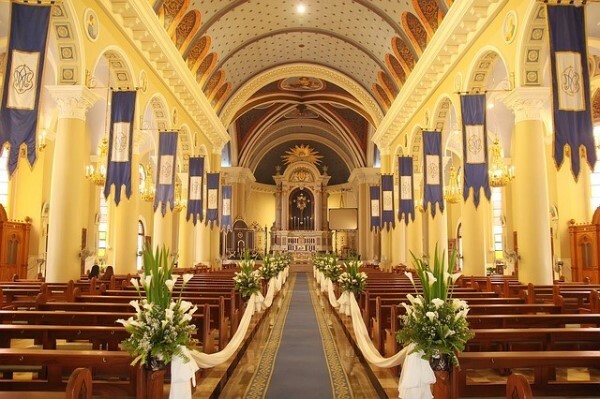 There are many different ideas on how to decorate a church for a wedding and flowers are usually top of the list. 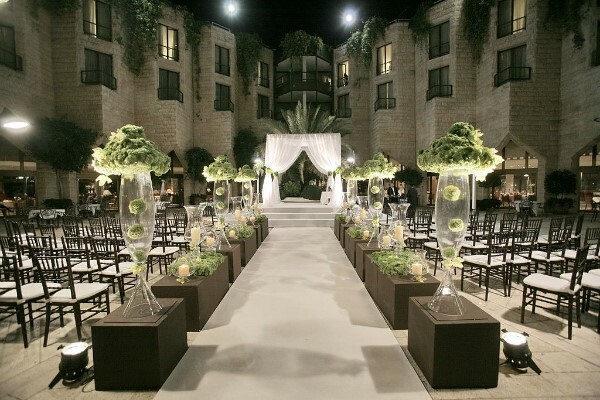 There are alternatives you can use if you do not love the idea of covering the ceremony site with flowers. Some of these alternatives include tulle, bows, candles and greenery. Many churches either already use a specific wedding arch or will allow you to bring in arches for your ceremony. 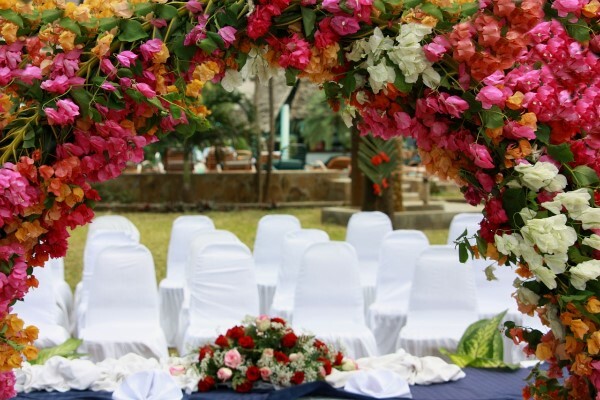 A wedding arch can be covered in vines, greenery, beads and flowers. 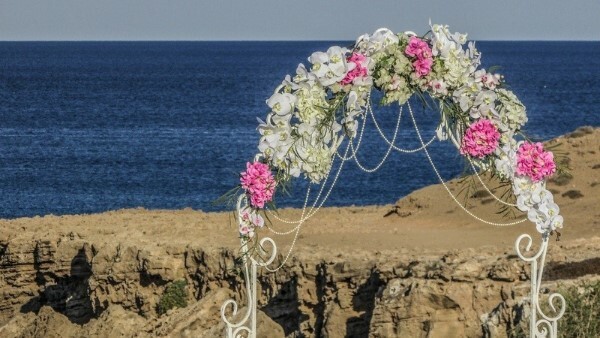 If you choose to use a wedding arch this will be a large concentration of flowers in one area. Although it can look absolutely stunning, it can also be an expensive decoration. You could choose to use an alter sign. There are many different ways to use an alter sign but one of the most dramatic ways would be a large hanging sign that hangs over the alter and then is decorated in flowers either bordering the sign or hanging below it. You could also use smaller signs above the wedding arch or on the alter itself. 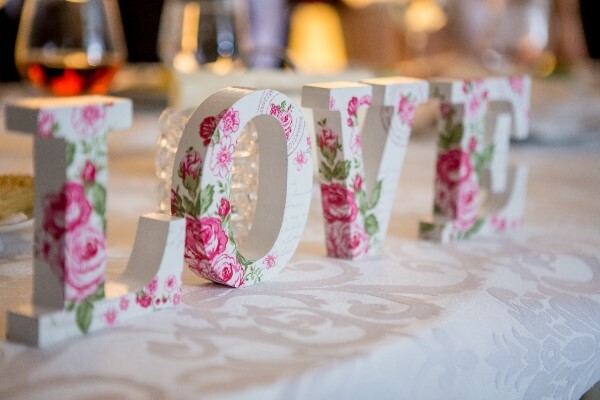 Signs could include your names or monograms, your wedding date or words like wed or love in individual signs (like one for L, one for O, one for V, one for E – and each of those signs spaced apart and decorated well). A lot of weddings will have at least one table cascade. This cascade will take up space in a table on the alter that is front and center. A cascade is a beautiful and stunning floral decoration and it can be moved from the ceremony to the reception, but again it is large and can be quite costly. You can offset the cost by the cascade also using greenery and other filler to limit the number of fresh flowers needed. Table garland is like table cascades except instead of a large flower arrangement it is smaller and thinner, but might be longer. The garland can be made completely of flowers, or it might be made of vines and greenery with flowers intertwined. Most people do not use both tables cascades and table garland, and when they do they are for separate tables. If you want to use both you might use the cascade on the center most table and the garland on any other tables either near the alter or in other parts of the church. The unity candle ceremony is one that is popular in all types of weddings these days, regardless of religious affiliation. If you do not know what the ceremony is – basically it represents two families becoming one. 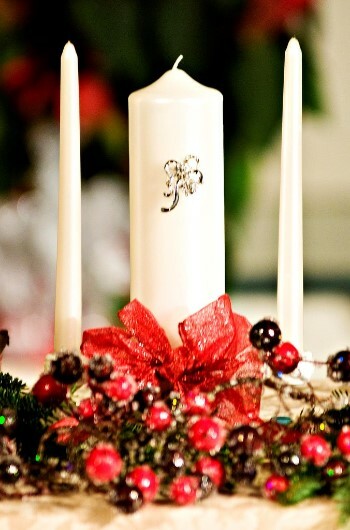 There is two taper candles to the left and the right of a large pillar candle. At the beginning of the wedding ceremony a representative from each family, usually the mother of the bride and the mother of the groom, light the tapers. After the vows are exchanged the bride and groom use the two tapers to light the large pillar candle. Sometimes the candles are on a table by themselves and that is perfectly fine. However some couples like to add some floral decorations to the table to make it extra beautiful. This does not have to be a large arrangement. It could be a few small vases or even a small arrangement with a platform in the middle to hold the candles above the arrangement. You might even just opt for some artfully strewn flower petals on the table. Table vases are some of the most common wedding flowers you will see at a church and they are also one of the easiest to transport to the reception site afterwards. Table vases can be uses anywhere in the church, they can fill in spaces near the alter that do not have flowers of other types of decorations and they can also be used elsewhere in the room you are getting married in as well as the lobby and at entrances and exits. Another popular choose is floral arrangements in floor urns. These can be places on either side of the alter as well as either side of the entrances and exits of the church. In the case of the floor urn, the actual flower holder – the urn – could be just as expensive as the flowers inside depending on the material used to make the urn as well as the intricate design on the urn itself. 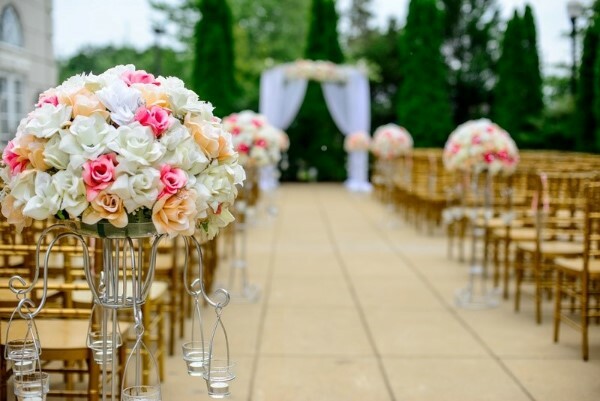 Much of this article so far has focused on the alter and it is certainly true much of your floral budget will be dedicated in that space there can be flowers in other places as well. One of those choices would be on the end of the pews. Many pews either already have bouquet holders are temporary ones can be attached. 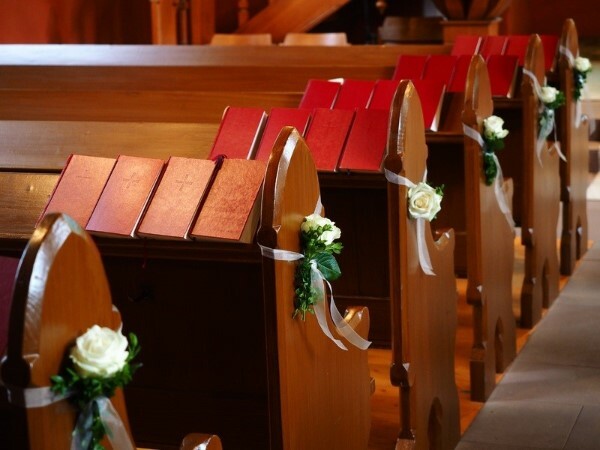 Each of the pews can hold a small bouquet to add to the beauty of the ceremony. 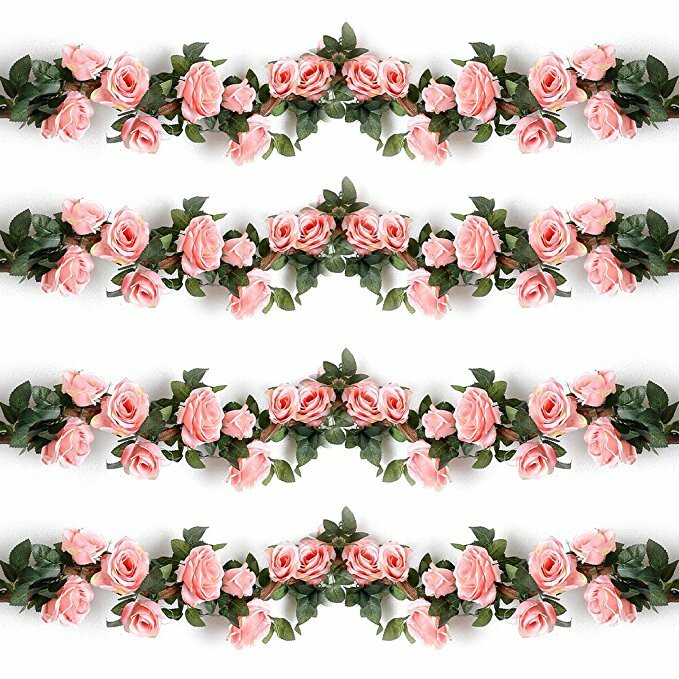 Like the idea of decorating the pews with flowers but are a little unsure on how the bouquets would look in your church? Why not use pew wreathes instead? Wreathes can be made in many different sizes from tiny to enormous. You can save money by having a bigger decoration with less flowers without sacrificing the beauty a pew decoration can provide. Lastly do not forget the aisle. If you do not mind the idea of flower petals you might consider decorating the wedding aisle with them. You can do this a few different ways. The first one, where you will use the least amount of petals would be to artfully scatter them down the aisle. If you do not like that look you can go to the other end of the spectrum and completely cover the aisle in petals. 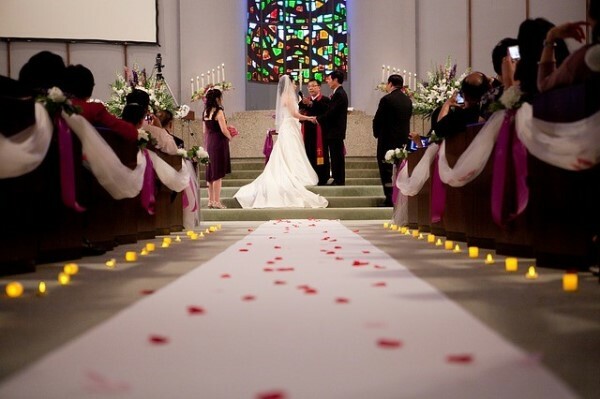 Another option would be to only cover the ends of the aisle runner with them, this way the aisle runner is still visible and you can still have flowers on it! If you are having a flower girl, you might want to have her have different colored flower petals so you can tell the difference between the petals there before the march and after the flower girl walks down the aisle. What we have already discussed might be more than enough flowers for you – but if it is not the reason is because we have mostly focused on the alter and the aisle. Those two areas are the areas that most people would expect to be decorated, so if that is all you want to do that is fine. However if you really love flowers there are other spots you can also decorate. You can put vases or urns in the corners of the room as well as the entrances and exits. For your specific church you will want to consider how people get inside the chapel area. Will they walk directly in or will they enter through a lobby. If there is a lobby how much time will they spend there? Will you be receiving your guests there after the ceremony? You might want to have floral arrangements in this area as well. Finally, do not forget outside the church – you can start with large wreaths on the church doors or urns on the steps. If you are leaving a different way than the front door (where your guests will blow bubbles or toss petals at you as you go by) you might want to decorate that area as well. Wedding Flowers in Church - What Flowers Will You Choose? So how are you going to choose your wedding flowers? Most brides use a few different ideas for this decision. First of all the most popular wedding flowers in a church are white and red. White to represent innocence and purity and red to represent love. People also tend to decorate either using their own specific wedding colors or the colors of the season they are getting married in. 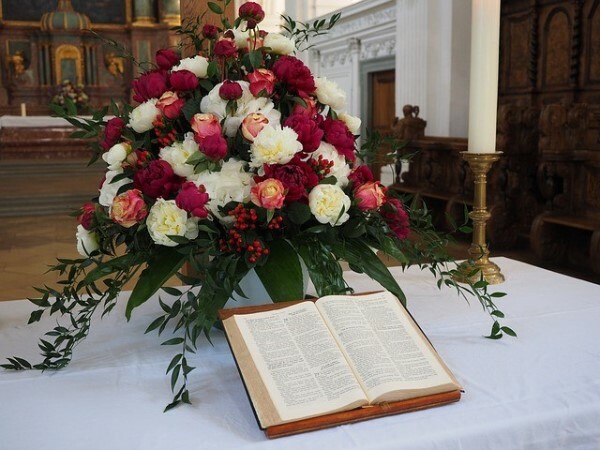 Finally you might want to consider any existing church decor before choosing your flowers. You do not want your choices to clash with how the church looks in such a way that it would affect the beauty of the ceremony itself. We have covered a ton of different ways that you can decorate for a church wedding, but this is not any wedding or any church, it is your wedding in your church. Before you go forward with your decorating plans you need to consult the church to find out any restrictions that might have. Depending on the church this could be none or it could be quite a few. 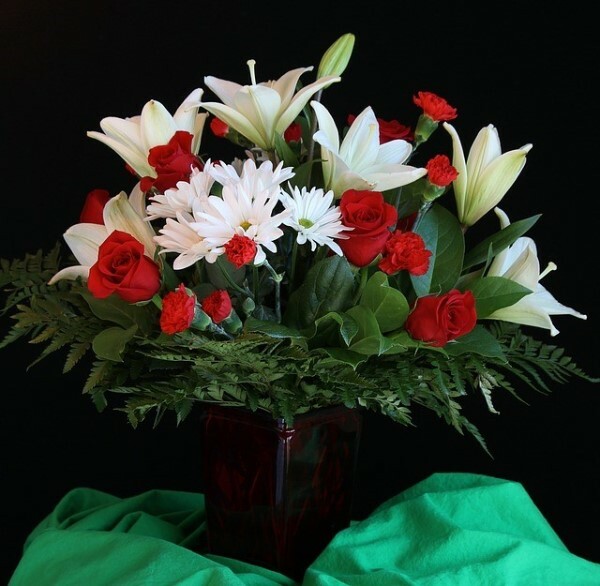 They may only allow flowers in certain areas or limit the amount of arrangements that you can bring in. 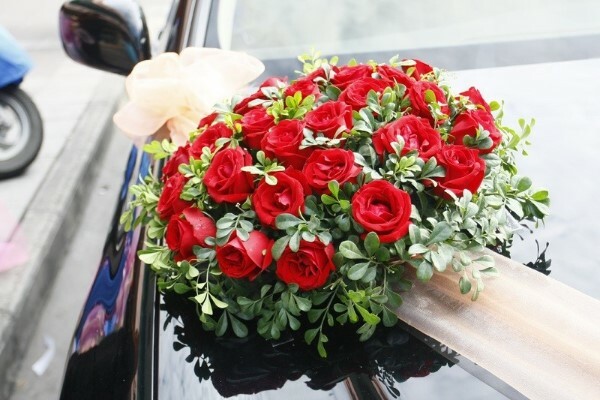 They may have restrictions you may have never even dreamed of – for instance maybe they only allow a few florists in your town to deliver to the church or may have banned a few. This does seem like something that could not happen – but think about it. Your church has weddings all the time, quite possibly more than one a week during wedding season for many, many years. They could of dealt with a specific florist who did things wrong – which could include not delivering on time, being rude to the church staff or even overpricing the bride and groom to a point that the church does not want to help them get more business. 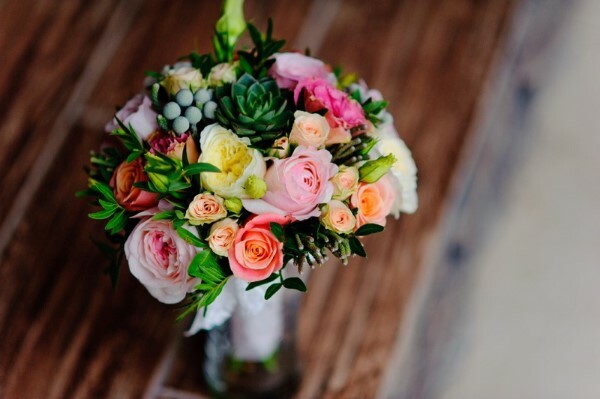 So before choosing a florist and what arrangements you can use, check with the church first on any restrictions that they might have in place.